Cost is easily one of the biggest concerns for small businesses. You know you need the tools to grow, but you can’t squander what you’ve earned so far. Field service management (FSM) software should provide you with the features you need to provide exceptional customer service but can’t break the bank. But, not to worry. There are many cheap field service software options with a wide range of capabilities. We’ve listed the best field service management software for small business starting with the most affordable options. Before we jump into the products, ask yourself a few questions that will help you frame your evaluation of the following systems. How Many Users Do I Have? Most FSM systems model their pricing around the number of users. You should think about your current number of technicians and growth you might experience soon. Think about the price offered at your current number of users, as well as the price for the expected number of users down the line. How Many Jobs Does My Company Perform? In addition to charging per user, many companies charge per job. This calculation isn’t always included in the sticker price, either. So make sure you fully understand the actual cost of your software before you buy. Vendors that offer very low prices may actually cost your small business more in the long-run. How Much Data Storage Do I Need? Many vendors love to boast about how their software allows technicians to document jobs with photo, video and audio. But unless your solution is on-premise, your vendor also has to store all that data. Make certain that your small business is allotted enough data for your operations. You don’t want to be surprised at the end of the year or month with storage fees. ServiceM8 offers the lowest price on this entire list, starting at $29 each month. The starting price will get you up to 50 jobs per month and access to the system’s core features. ServiceM8 has several other plans, with the most expensive sitting at $349 for 1,500 jobs. ServiceM8 allows your techs to tasks with handy checklists. All plans feature a great client-facing UI. Customers can book appointments, receive quotes and pay right through the app. What’s more, you can use the system to notify your customers when staff members are arriving and send reminders for future appointments. Keeping your clients in the know is an easy way to raise customer satisfaction. But there’s plenty of functionality for you and your staff, as well. Job management provides access to client and job information on-demand. You can create checklists and set up recurring jobs to standardize performance. Additionally, all plans offer scheduling, quotes and invoicing, job history, and technician tracking. The core features are surprisingly robust but job costing, margin billing and form management are only available in the more expensive plans. ServiceM8 is a cloud-based product and is recommended small business field service software. Jobber starts at $69 each month for two users and goes up to $259 for unlimited users. The core plan allows users to produce quotes and invoices, and manage timesheets and other documents. It also syncs up to popular accounting systems Quickbooks and Xero. Jobber includes CRM capability and a client portal to help you maintain customer satisfaction. 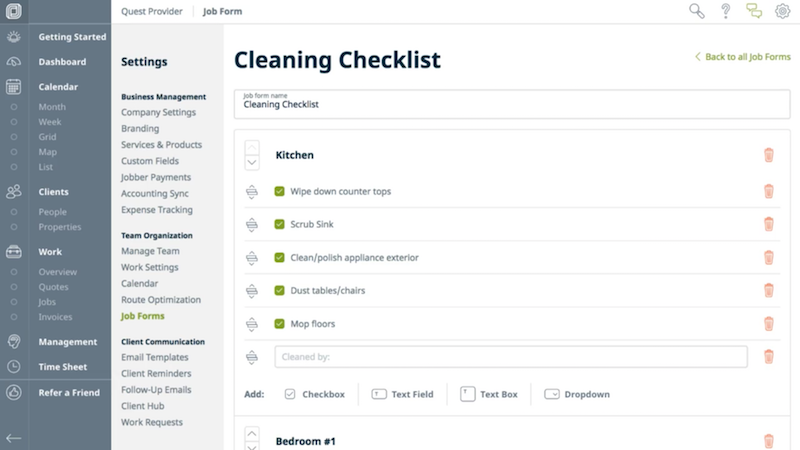 Jobber allows users to add or delete items from a completion checklist to ensure a job is finished properly. Further, Jobber provides chemical tracking on all plans. Chemical tracking allows your business to audit your chemical and pesticide usage and report it when you need to. Jobber’s premium plans offer additional features like job forms, client requests, routing and GPS, time tracking, and alerts. Jobber is one of the best field service software for small companies and is a cloud-based product. WorkWave is an excellent small business field service management software, particularly for those looking for an easy-to-use solution. One of the main selling points of this system is its interface. Colorful and intuitive, this UI makes managing your field service a breeze. WorkWave allows office staff to manage accounts, schedules, billing and business development all in one place. 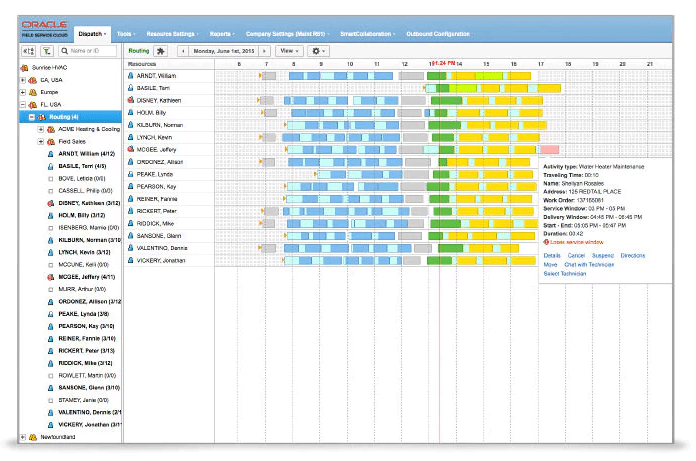 WorkWave strikes a good balance of color and streamlined design when it comes to scheduling. Users can set up service reviews within the app to gather feedback and generate positive reviews online. Office users are able to access reporting and analytics tools as well. These include pre-built and customizable reports that utilize service KPIs, reviews and GPS records. WorkWave also supports mobile field force management. 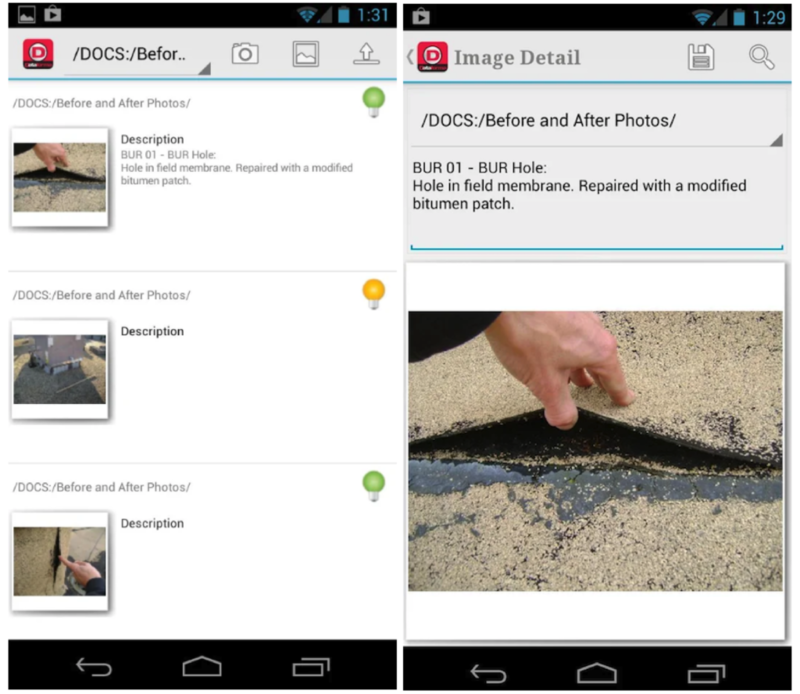 Field technicians benefit from the mobile app, allowing them to access and record information from anywhere. Its field force automation tools allow this information to be sent back to the office without any user intervention. This helps streamline operations and improve efficiency. In fact, WorkWave Service users have reported 20 percent increases in revenue, 21 percent increases in job completion and more than 30 percent savings in fuel costs. WorkWave is available both on-premise and in the cloud, which means your company can scale the system up or down, depending on your needs. This makes it a great field service software for small business and for those looking to grow. Get our Field Service Management Software Pricing Guide. Dataforma was made by contractors for contractors. This makes its interface especially easy to use and adopt. Dataforma manages all your basic functions like scheduling, dispatching, invoicing and tracking. The mobile app notifies technicians when new work orders are added or modified. The app also provides a way to take organized notes on labor and materials. Dataforma is available both as a cloud-based product and on-premise. However, only the web-based solution will automatically backup your data each hour. And while it’s suitable for small businesses, it can also be utilized by medium and large businesses. This is great if your company is expecting growth and you don’t want to switch vendors when the time comes. ServiceFusion’s plans start at $99 each month and go up to $349. All plans offer unlimited jobs and users. The starter plan manages scheduling and dispatching, invoicing, payments and reporting. It also supports multi-phase projects and integrates with Quickbooks. Your customers will enjoy text alerts when technicians are on the way and receive appointment reminders. 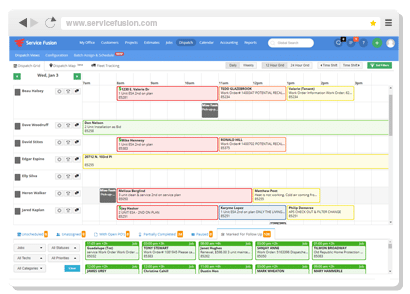 ServiceFusion’s tools quickly give users insight into job scheduling. If the basic plan isn’t enough, you can purchase individual features from the larger plans without moving up to the next price point. Additional features include job costing, ability to take and upload photos, a documents module, inventory management, and a customer portal. This small business service software is only available in the cloud. Aimsio is a flexible product, allowing buyers to pick and choose which modules to implement. It contains three core modules: dashboards, workflows and reporting. The workflows module exists mainly to move your company from paper to digital. Aimsio provides a mobile interface while never sacrificing intuitiveness. It allows you to create digital forms that look exactly like their paper counterparts, enabling you to maintain a nearly identical administrative process. The only difference is that you don’t have to worry about losing documents or having to dig through file cabinets. All information is readily available to both office users and field technicians. 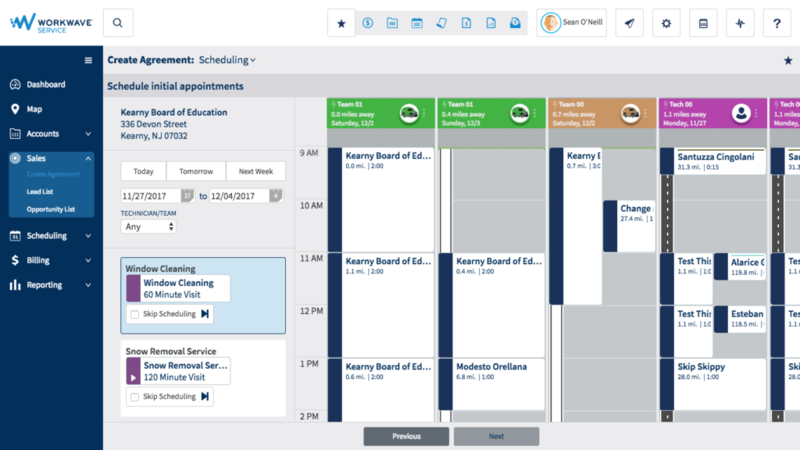 Additional modules include a job board, which office staff can use to dispatch crews and manage scheduling. There’s also project tracking for more complex work. Additionally, this module includes a budgeting tool to keep your company on track during lengthy projects. Other modules manage compliance regulations, create invoices and support integrations with third-party software. ServiceTitan reports an average revenue growth of 25 percent within the first nine months for its customers. This is due to the strong in-office and field tools this vendor provides. In the office, you’re able to keep track of calls, booking rates and other service KPIs to evaluate your performance. You also have this ability for technicians and can see their estimates sold and estimate conversion rates. ServiceTitan enables your office staff to see revenue across jobs and invoices. The dispatching tool is very user-friendly and provides a drag-and-drop tool for easy scheduling. Moreover, office staff have access to custom reports so you can see trends by department, business unit or by date. Field workers also have access to tools to make the job more efficient. First, your technicians can retrieve complete job information in the field at any time. This includes previous work done for a client, unsold estimates and billing information. Moreover, your field technicians can process payments with ServiceTitan, whether it’s using card, cash or check. They can also create estimates using photo and video. ServiceTitan is available as both a cloud-based solution and on-premise. GeoOp’s initial price is actually quite low at $49 each month. But their most popular plan starts at $229 with top plans exceeding $1,000 for 100 licenses. While these aren’t rock-bottom prices, GeoOp ensures that their fixed monthly fee is all a company will pay. There are no hidden fees for exceeding a certain number of jobs or data storage. Field techs can access job information in the field using GeoOp’s mobile app. In addition to its flexible pricing options, GeoOp provides all the key features a business needs for successful field management. This system works to streamline your office functions by centralizing labor management, customer information, profit reports and invoices. Your staff can charge customers using the timekeeping tool to ensure your company is paid correctly. Further, you can set permissions for users and even customers so everyone gets the visibility they need. Your field service technicians can benefit from GeoOp, as well. 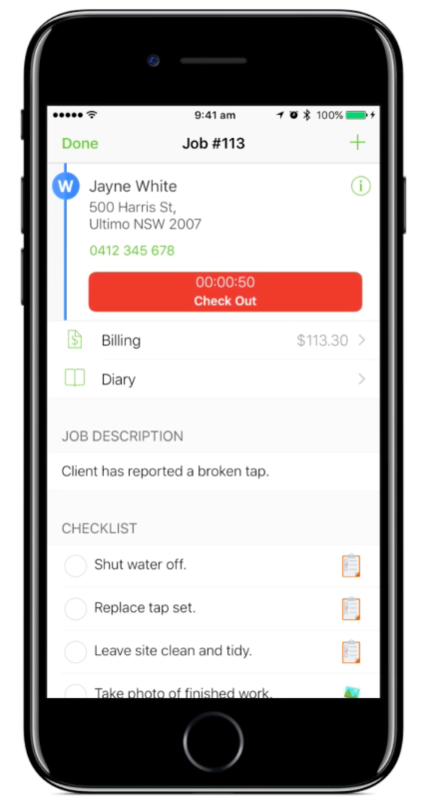 The easy-to-use UI facilitates documentation of job details and allows messages to be sent between the office and field users. The app also supports jobs that require several different appointments. This helps keep all relevant information in one place so your technicians can work without interruption. GeoOp is great for small and mid-sized businesses and it’s available in the cloud. Similarly to GeoOp, mHelpDesk’s basic packages are very reasonable. In addition to these starter plans, mHelpDesk also caters to enterprises looking for a customized system. This makes it another great option for companies who simply can’t do business with a less capable system. mHelpDesk is an end-to-end field service solution, containing estimation, job creation and invoicing tools. The most basic package provides scheduling and job management tools. In addition, there’s invoicing and payment processing for a limited number of jobs. 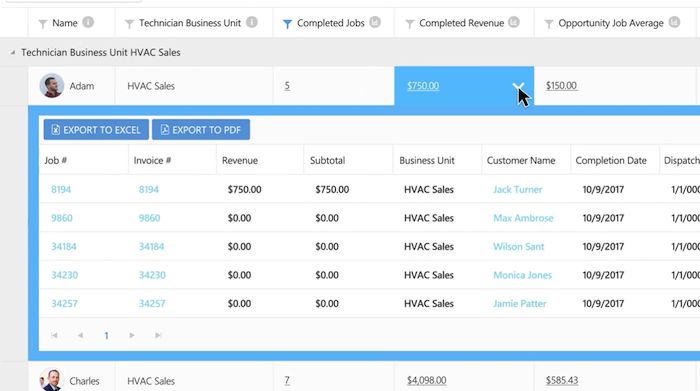 The Pro package adds on more jobs, syncs with Quickbooks and allows you to track equipment. Higher-tiered packages provide more users, more jobs, custom forms, location tracking and inventory management. mHelpDesk is conveniently located in the cloud and its basic packages are recommended for small businesses. Medium and enterprise-level businesses would benefit from the more powerful plans or a customized pricing plan. Oracle’s FSM software is offered as a core package with modules you can add on, as opposed to a tiered pricing model. This means that Oracle can provide pretty much every feature you’d need but won’t feel like an oversized system. From automated routing to multi-language support to resource mapping, this solution is all-encompassing. Oracle provides comprehensive field service tools, including scheduling and dispatch features. Built on self-learning and predictive technology, this solution allows your business to remain one step ahead of any issue, ensuring you maintain your SLAs. This product also boasts first place among ranked systems on our FSM Leaderboard (and isn’t even the most expensive option). Oracle is a great choice for all company sizes and is available in the cloud. These are all great options if cost is a major concern for your small business. However, every company has different needs and it’s possible that the software system with the best fit for you isn’t on this list. While of course it’d be nice to save some money, you actually might see a better ROI on a solution that truly caters to all your needs, even if its a bit more expensive. This is especially true for medium-sized businesses that might find small business field software inadequate. Our In-Depth Comparison Report compares Oracle, mHelpDesk and eight more top systems against popular requirements identified by our analyst team. Tired of creating invoices manually? See which field service systems have the best billing. Want to better understand how your business decisions influence profits? Check out the systems with top analytics tools. While cost is a major factor for any buyer, it shouldn’t be the only one. Thanks for sharing this wonderful researched article, it helps a lot of people and organizations who are looking for the same. I want to add and suggest one more platform that provides route planning, employee location tracking and some other features like order management, task scheduling, custom forms and my personal favorite selfie attendance. Route planning is the best way to improve sale team work efficiency. To manage our sale forces we are using FeetPort that provides mobile app and web console to track field workforce, generate custom reports and much more. I hope this will be helpful for many organizations. See the Price/User for the top Field Service Software... plus the most important considerations and questions to ask.